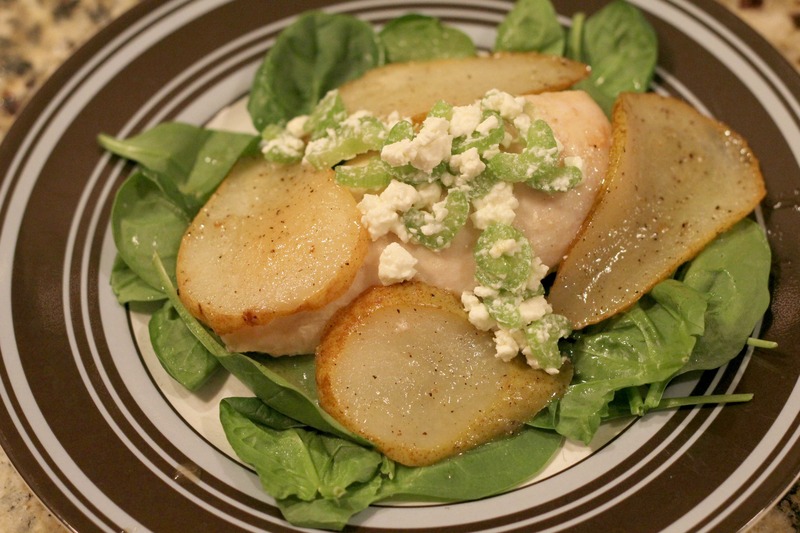 Never in a million years would I have thought of putting chicken, pears, celery, feta, and spinach all together in one dish. It’s not that the combination sounds gross or anything, it’s just not a combination that seems common…or that even makes sense. When I looked at the recipe, I’ll admit, I did the one-eyebrow-raised-this-looks-suspicious face. But, I am now a believer in this seemingly nonsensical mash-up of random food items. We LOVED it! The roasted pears were definitely my favorite part. The honey glaze just made them so sweet and delicious! I could just eat those pears as a snack by themselves. But what was really surprising was how well everything went together. The chicken was good, but having a bite of chicken with feta, celery, and a bite of pear all together on your fork was just sublime! Preheat oven to 450 degrees F. Lightly grease a large baking pan with cooking spray. Place chicken on one side pan. Brush with 1 t olive oil and sprinkle with salt. Roast 10 min. Meanwhile, toss pears with honey, 2 t olive oil & pepper. Add pears to the other side of baking pan. Roast 10 min or until chicken is done. Combine celery, feta, and vinegar. 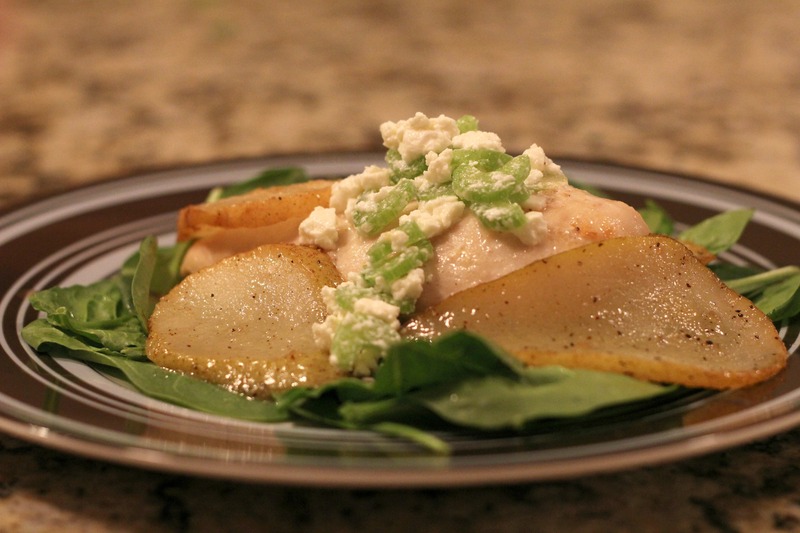 Divide spinach into 4 servings; top evenly with chicken, pears & pan sauce. Top with celery mixture. That seems at first glance a very strange mix. On thinking about it, I would say they go so well together. Good one!